The photo above shows an example of a good “crest release,” in which the rider places the hands on the crest of the horse’s neck (i.e., on the muscle just below the mane) and presses down. This type of release provides the rider with some upper-body stability and allows the horse to extend its neck as far as possible so that the weight of the neck can successfully be used as a counterbalance to the weight of the horse’s haunches. It is extremely important for the rider not to interfere with this counterbalancing process, known as the “bascule,” which enables the horse to keep its balance in the air. If the horse feels restricted by the rider’s hands in the air, the animal will begin to add an extra step at the base of the fence at take-off, known as “chipping,” or will begin to stop at the fences. Restriction of the neck in the air causes the horse to be anxious and even fearful if the rider holds the horse tight, rather than offering a generous release. The second photo shows a rider “jumping out of hand,” with a light feel on the reins that enables the rider to maintain contact with the horse’s mouth. This type of release should only be used by advanced riders who are totally secure in their position. The rider should let the horse take all of the rein it needs to fully extend its neck, then keep a very light feel that will enable the rider to be ready for tight turns, tests of precision, or whatever else may be called for in the show ring. 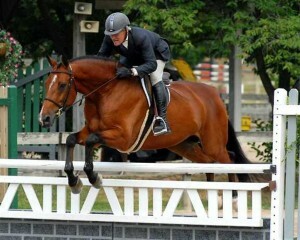 If a rider tries to jump out of hand before he is ready, he will do more harm than good in his performances. Heavy rein contact that restricts the stretching of the neck or an unsteady hand in which the rider uses the reins to keep his own balance will result in the horse chipping or stopping. One of the main mistakes riders make when approaching a fence is to keep heavy contact on the reins, then quickly fling the hands forward at the moment of take-off. As you approach a fence, you need to gradually ease the tension on the reins by following the horse’s neck as it extends a couple of strides in front of the fence. The head and neck will naturally go down and out as the horse crouches to jump, and if the animal feels trapped by the hands the last couple of strides, it will often “lose heart” and chip or stop. When you’re first beginning to jump, you should grab a little mane in one hand and press down on the neck with both hands so that you make sure you won’t “hit the horse in the mouth” and cause it to want to stop or chip. 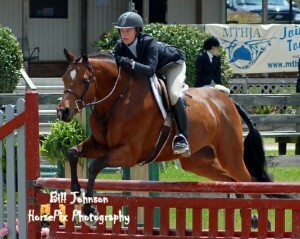 The photo below shows a rider who is “with the motion of the horse.” She has a very secure position because her upper body is balanced over her legs. The rider is correctly positioned in the sitting phase of the posting trot. 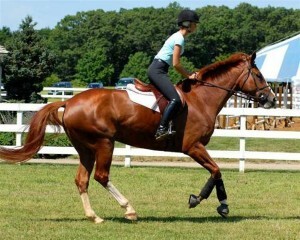 In the photo below, the rider’s upper body is “behind the motion” of the horse. Her legs are so far forward that they cannot support her upper-body weight. Instead, she uses the reins as a means of support. This type of prolonged “hanging on the mouth” will deaden the nerves in the horse’s mouth and make the animal ever harder to control. The rider is "behind the motion" in the sitting phase of the posting trot. The rider below is “ahead of the motion” in her upper body. 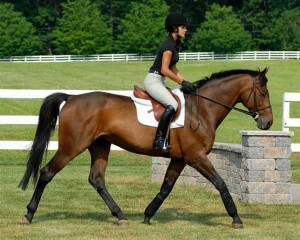 The horse is in a medium frame, but the rider’s upper body is inclined so far forward that she looks as though she would be hacking a horse in the woods on a long frame. Her leg has slipped back, making it difficult for her to stay balanced in her upper body. Consequently, she is leaning on her hands to support her upper-body weight. Also, notice how far back in the saddle her seat is. She is landing on the cantle of the saddle, rather than posting right behind the pommel. 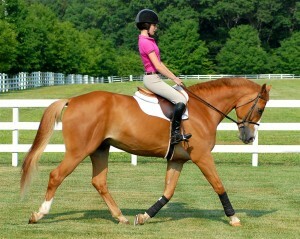 The rider is "ahead of the motion" in the sitting phase of the posting trot and is on the incorrect diagonal. 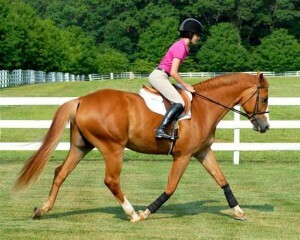 A rider can be “behind the motion” or “ahead of the motion” in the upper body without the leg being out of position. However, when the leg slips forward, the upper body usually falls back; and when the leg is too far back, the upper body usually falls forward. 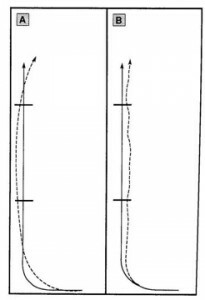 The USEF Rule Book states that the “position in motion” at the “posting trot, inclined forward; galloping and jumping, same inclination as the posting trot” (EQ 108, #4). When the horse is travelling in a medium frame, the rider’s upper-body inclination is about 20 degrees in front of the vertical. This is achieved at the posting trot by the rider closing the hip angle and posting with more weight on the crotch than the buttocks in the sitting phase. 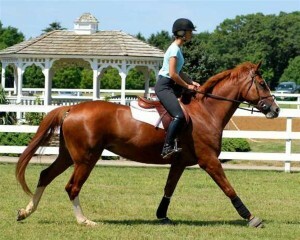 Carolyn Curcio demonstrates the proper upper-body angulation during the sitting phase of the posting trot. 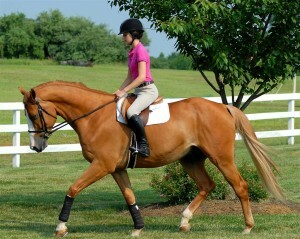 A rider's upper body should be about 20 degrees in front of the vertical when the horse is collected into a medium frame, as shown. The angle of the upper body depends upon the degree of collection of the horse. For example, if a horse looks its best being shown in a long frame in an under-saddle class, then the rider’s upper body would be inclined slightly more than 20 degrees to match the flatter carriage of the horse. On the other end of the spectrum, if a rider is asked to perform a “working trot with a lengthening of stride” in a USEF Talent Search Class, then the upper body would become slightly more erect so that the rider’s weight could subtly help the legs as a driving aid. The idea of “form to function” is relevant in many sports, with the emphasis being on how a particular position makes an activity easier to do and prevents performance errors and injuries. Whether it is how a tennis player holds the racket and follows through with the swing, or how a springboard diver gets enough height in the air and enters the water with no splash, the degree of accomplishment depends upon the quality of the athlete’s form. Our sport is just the same, with form being important for the success of the rider, not only in an equitation class in which rider form is judged, but also in hunter classes in which the rider’s good or bad form affects the horse’s performance.